Desert forms, dynamic light and sound unite in a mesmerizing display of motion and color. Cactus and desert become a living canvas in this nighttime experience, taking visitors on an immersive journey through the garden using light and original music. Electric Desert includes seven discrete installations by Klip Collective. Using projection and lighting, Klip transformed cacti, succulents, and rock formations into a living nocturnal canvas, using the Garden and its unique landscape as a backdrop for new and exciting audio and visual experiences. Cacti Synthesia is a projection and sound installation in the Cactus Gallery of Desert Botanical Garden. With hundreds of projection-mapped cacti, this exhibit is one of the most popular and photographed features. Following a theme of water throughout Electric Desert, the cacti appear to transform into coral reefs, giving the viewer a feeling of being underwater. The desert environment offers a whole new canvas of garden forms, including the majestic butte. Desert Chorale is a main feature of Electric Desert with a light and projection show playing every 20 minutes on the hillside of saguaros. Lighting plays a larger role in this seven-installation experience with hundreds of pixel-mapped LEDs and an eight-foot tall infinity mirror light sculpture. 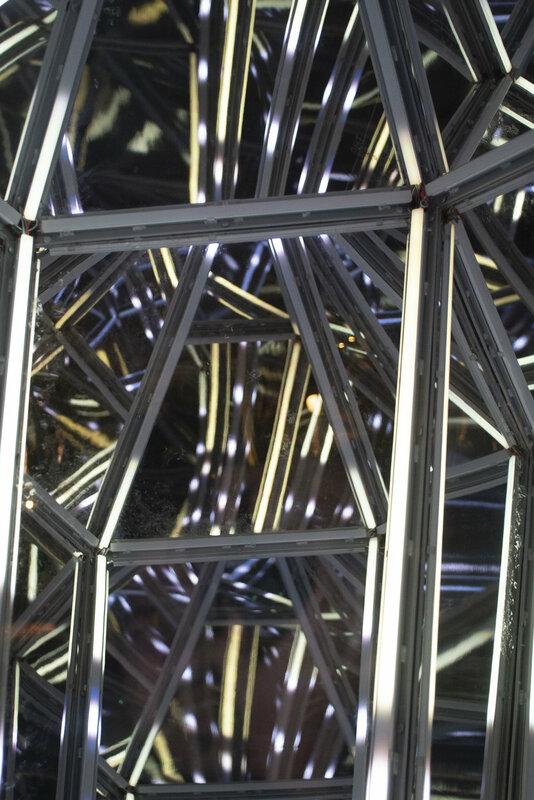 Infinity Crystal is an infinity mirror sculpture that uses form, light, and mirrors to create the illusion of infinity. During the day, the mirrors reflect the landscape around the sculpture, but at night, Infinity Crystal transforms with light, color, and movement. This unique animated neon light technology uses smart LEDs to create dynamic patterns and movement with digital video.